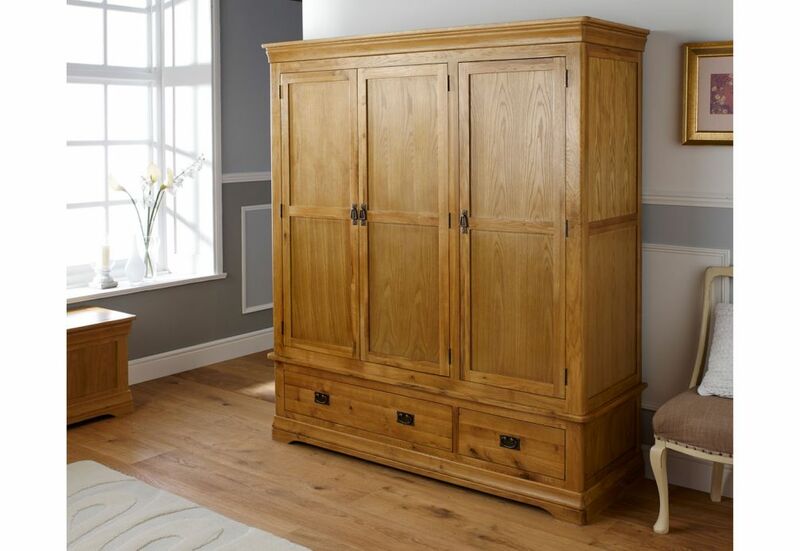 The stunning Famhouse Country Oak Large Triple Wardrobe is one of the biggest examples that you will find in the UK. 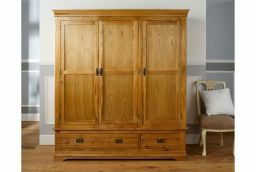 Made from sustainably sourced American oak this classic French Farmhouse design will be the focal point of any bedroom. The amount of storage space behind the upper doors is incredible with room for a vast amount of shirts, suits or dresses. 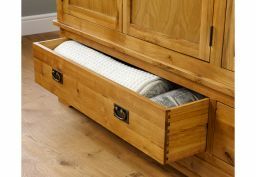 The large drawer space at the bottom adds even more storage space. 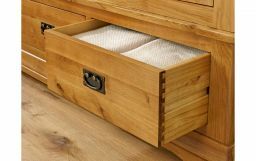 Dovetail joints come on standard on the lower drawer units to ensure that the structure is as strong as possible and built to last. 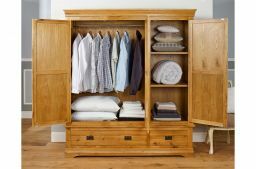 Please note that this wardrobe requires some assembly for the top section which has now been added as an optional paid service on the checkout page for most postcodes. 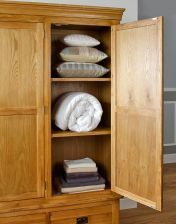 The lower drawer unit section of the wardrobe comes fully assembled in its own box but the larger upper section would be too large for us to deliver into most homes if it came fully assembled in a box. Dimensions: W 1725 x D 595 x H 1925 (mm) Upper section box size - 170cm x 146cm x 15cm, Lower section box size - 174cm x 45cm x 61cm. Available to view in our Uttoxeter, Staffordshire warehouse showroom. Our wardrobe arrived with the drawers all put together and the top part flat packed. It was extremely easy to put together and was completed in about a hour. 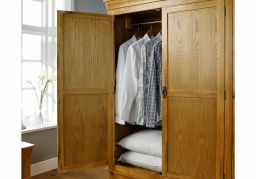 The wardrobe is very sturdy and has a beautiful finish. Loads of storage space inside, perfect for a couple. Wow. The storage in this wardrobe is fatastic. Having completely renewed all bedroom suite with is range it has surpassed my expectations. Top quality and looks beautiful. An early Xmas present to myself and worth every penny. good product, but not easy to get top square with bottom section, it would be so simple to have holes drilled in base of lower unit inside drawer going into lower frame,which would make it square and also help with securing both parts. The wood is a lovely colour and very strong. While the door handles are weak and feel as if they might break any second the wardrobe was easy to put together and is very spacious. The quality overall is great for the price we paid. This wardrobe is of superior quality and certainly the most beautiful piece of furniture I own. It was very easy to assemble but is a two man job. Very good quality and friendly delivery drivers. The quality of the furniture was superb and the way it was provided in flat pack form enabled me to transport up my stairs with no bother and as it was on hinges the assembly took no time at all. 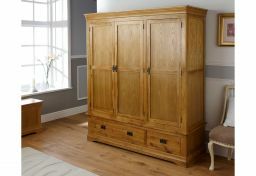 Value for money it beat hands down any of its competitors and it is a stunning piece of furniture which looks great in my bedroom. I would definitely recommend this product.